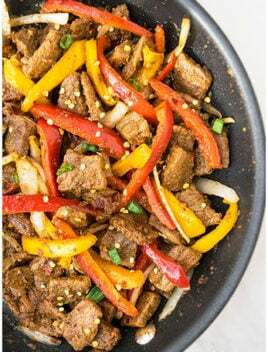 This quick & easy spicy beef stir fry with red peppers is inspired by Asian/Chinese flavors. Tastes better than take out and best served with rice/ noodles. This simple HOMEMADE spicy beef stir fry from scratch is one of my family’s favorite meal. We LOVE spicy food and this meal always hits the mark! Now, this is not your classic beef stir fry since it has some ingredients that you would not find in the classic version but regardless, it’s a DELICIOUS weeknight meal and I am crazy about it! Make sure to use low sodium soy sauce or else everything will become too salty. Use peanut oil or sesame oil since it adds a nice flavor and fragrance to this meal. This is meant to be a VERY spicy stir fry recipe but you can adjust the spice level, based on your preference. Make sure to use a WIDE pan, wide skillet or a wide wok so that the beef cooks evenly and quickly. If you like beef stir fry with gravy or sauce, mix together 1 tbsp cornstarch with a 1/4 cup beef broth or water and add that to the pan at the end and let everything cook on medium high heat for 1-2 minutes until the sauce thickens. I like my beef very well done. So, I cook for 10 minutes WITH the lid and then another 10 minutes WITHOUT the lid to reduce the liquid. 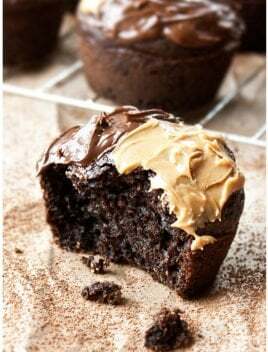 Tastes BEST when served immediately but you can also store in a sealed container in the fridge for up to 2 days and heat in the microwave. How to make beef stir fry strips? The process is very simple. Start off by preparing the marinade and then soaking the beef in it for 20 minutes. Then, heat oil in a pan and add the marinated beef pieces. Cook on medium high heat until the liquid gets reduced and starts to thicken. Stir occasionally. Lower the heat to medium and add red peppers, yellow peppers, onions and mix it all together for another 5 minutes until the veggies are crisp but tender. How to make stir fry with vegetables/ frozen vegetables? 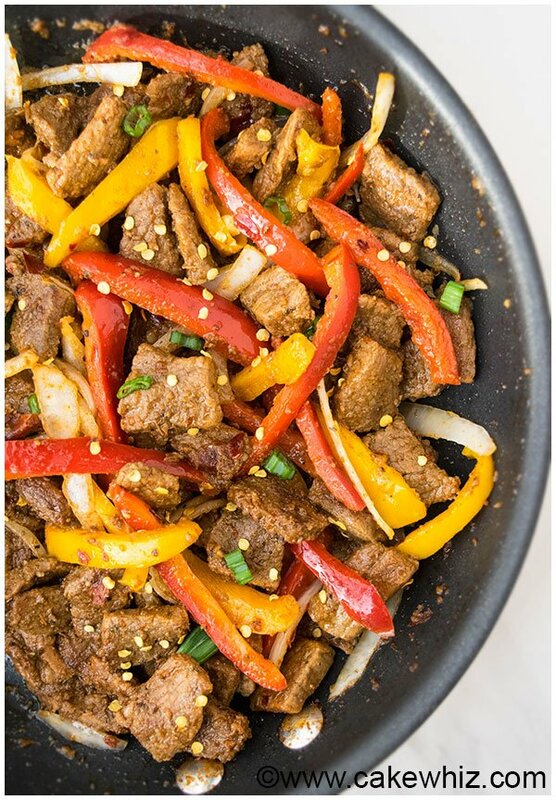 I am only using red peppers, yellow peppers and onions in this recipe but you can also make beef stir fry with broccoli, cabbage, mushrooms, peppers or snow peas. Make sure to cut the vegetables into strips or small pieces. 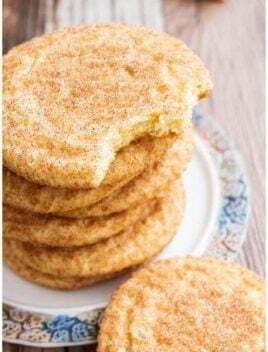 Add them in the last few minutes of the cooking period or else they will become too soft and soggy. You want the vegetables to have a little bit of crunch. How to marinate beef stir fry? Mix the marinade ingredients together in a deep bowl and soak the beef pieces in it for at least 20 minutes. 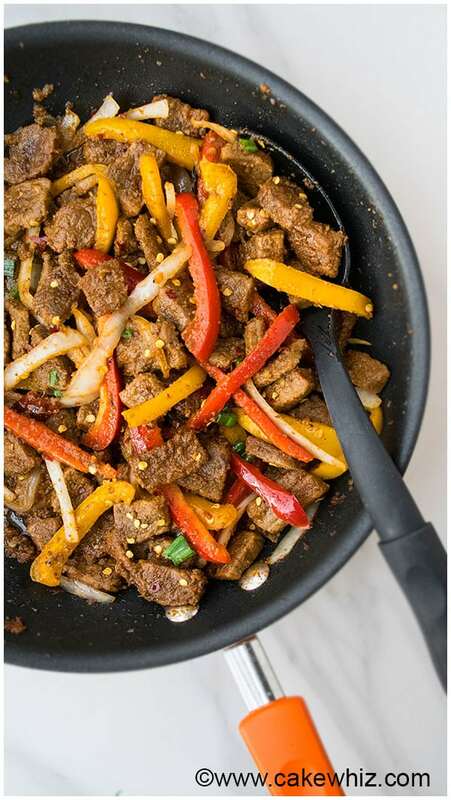 How to make/cook beef stir fry tender? 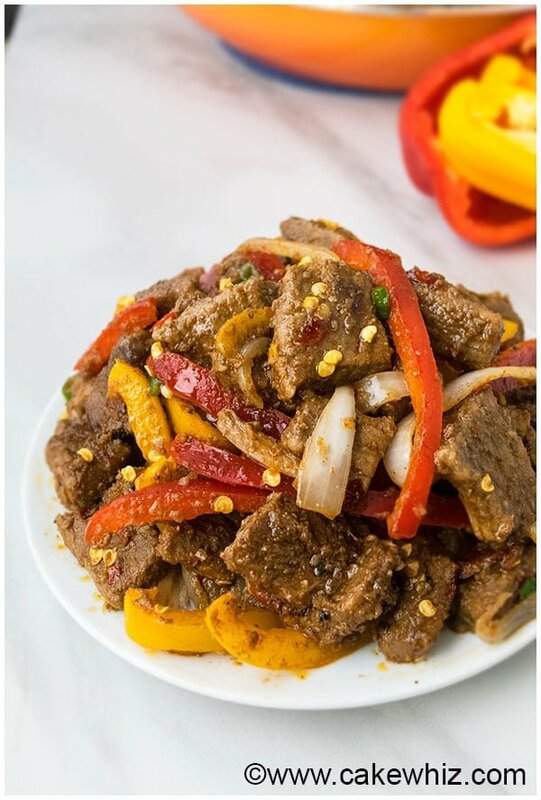 How to get beef stir fry tender? How to tenderize beef stir fry? You can either use a meat tenderizer powder or simply COVER the pan and cook on medium high heat in the beginning for 10 minutes. Then uncover the lid and continue stir frying until all the liquid is reduced. This process makes the beef so juicy and tender. How to cut beef stir fry? Beef in stir fry is typically cut into thin strips against the grain. 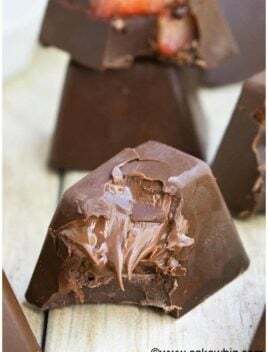 You can cut them in cubes too but that would take a bit longer to cook. What goes with beef stir fry? What to serve beef stir fry with? How to season beef stir fry? What to season beef stir fry with? What to marinate beef stir fry in? How to make beef stir fry sauce? I use a simple beef stir fry marinade rather than just using dry spices. The beef soaks up more flavor this way. My simple stir fry marinade is composed of the following ingredients: soy sauce, pepper, red chili powder, crushed red chili peppers, vinegar, Sriracha sauce, ginger paste and garlic paste. Marinading the beef strips in this mixture will yield the most flavorful stir fry ever! What beef to use for str fry? Which beef cut to use for stir fry? I like to Sirloin steak but you can also use chuck. It has to be boneless beef. How to make beef stir fry with noodles? I cook the noodles separately and mix them into the prepared pan of beef stir fry at the end. Cooking everything together can sometime cause the noodles to get over-cooked and soft/mushy…Ewww! 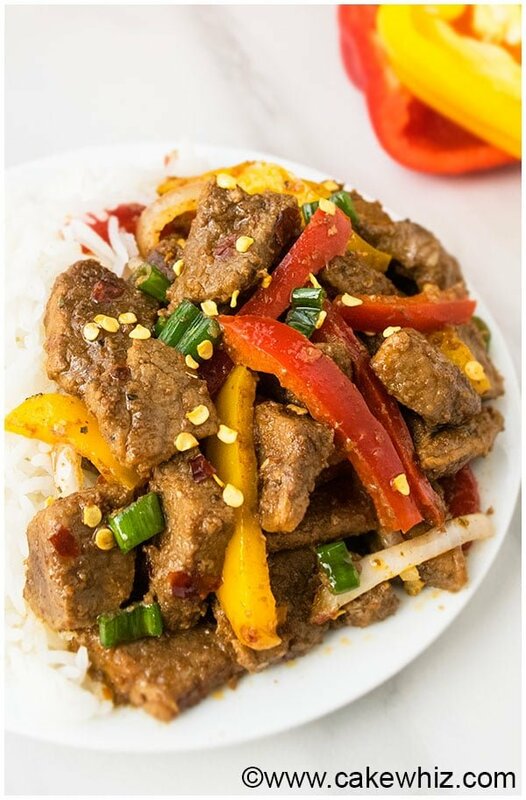 How to make beef stir fry with rice? Just like noodles, I prefer boiling the rice separately and then mixing it into the prepared pan of spicy beef stir fry at the end. Cooking everything together can sometime cause the rice to get soft and soggy! Start off by preparing the marinade in a deep bowl. Mix together soy sauce, Sriracha sauce, ginger paste, garlic paste, vinegar, crushed red chili peppers, red chili powder. Add the beef pieces in this marinade and mix it thoroughly. Keep aside for 20 minutes. In a wide pan, skillet or wok, heat oil on medium hight heat. Add red peppers, yellow peppers and onions and stir fry for another 4-5 minutes. Garnish with green onions and red chili peppers. Enjoy! 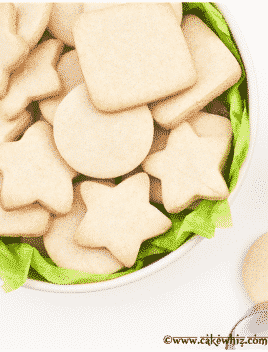 - Leftovers can be stored in a sealed container in the fridge for up to 2 days although it tastes best when served fresh. 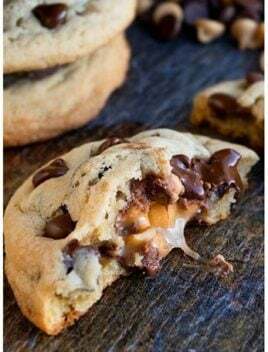 A possible small correction in the recipe. You list 3 tbsp cup low sodium soy sauce, I assume its just 3 tbsp, no cup included? Also have you used fresh ginger and garlic instead of the paste? 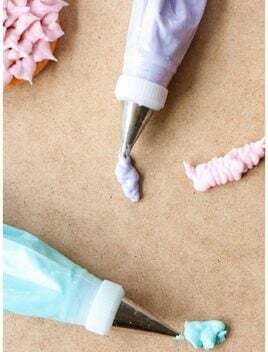 Those tubes of paste are quite expensive if you don’t use them regularly where fresh is way cheaper and probably better. I think I would finely chop the fresh and use same measurements. What is your suggestion? Oops! Thank you so much for pointing that out. I just fixed it. Yes, you can use fresh ginger and garlic (finely chopped) in same quantities or adjust the quantities, according to your preference.